Cobblers Cove invites you for Cobblers Live – four nights of Caberet, Comedy and A Capella. 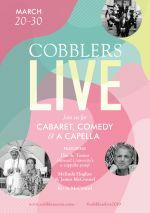 Cobblers Live is all about bringing together good food, music and company together under the stars of Barbados for an evening that will create a memory. 3-course After Show Dinners will be served, designed by resident Chef Jason Joseph. Featuring The Harvard Din & Tonics, Melinda Hughes, James McConnel and Kit. All dinners begin with Cocktails at 7:00 pm nightly. A repertoire inspired by American jazz of the 1920s, 30s and 40s. Snappy choreography, hilarious antics and musical bravado. A riotous evening of opera, comedy and satire on life, love and politics with soprano and satirist Melinda Hughes, accompanied by James McConnel. Caberet duo Kit & McConnel present an evening of irreverent songs, wicked sketches ans all-rounded silliness.